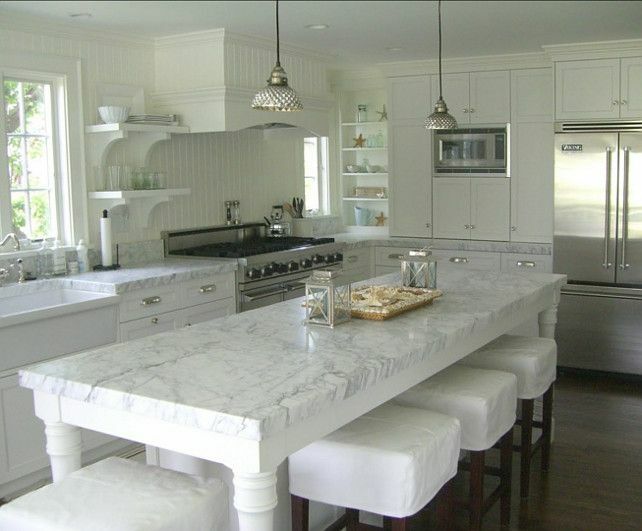 There is a new trend rising for kitchen design and I absolutely love it! It’s the pantry wall. So what is this concept? It concentrates storage, the refrigerator, oven, and microwave on a designated “pantry wall” made up of floor to ceiling cupboards. This makes getting rid of upper cabinets easier and really opens up the kitchen. Now I know this isn’t for everyone and some will scream about the lack of storage by ditching the upper cabinets, but hear me out. I’m short. Well not that short at 5′ 7, but short enough to make reaching up in to cabinets a challenge and something that I hate to do. I already tend to shove as much into my base cabinets as I can and everything else ends up in a pantry closet. 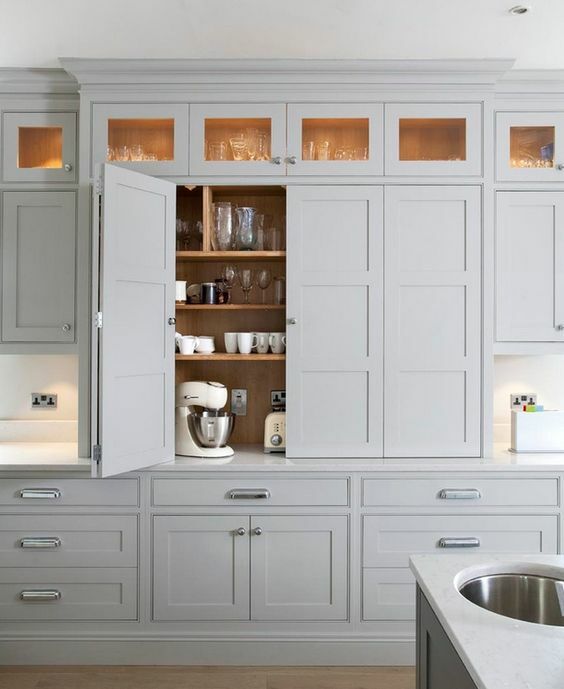 So why not embrace this wall of cabinetry! By eliminating the gap where a counter normally sits you have very reachable storage available for glasses, dishes, and everyday items. 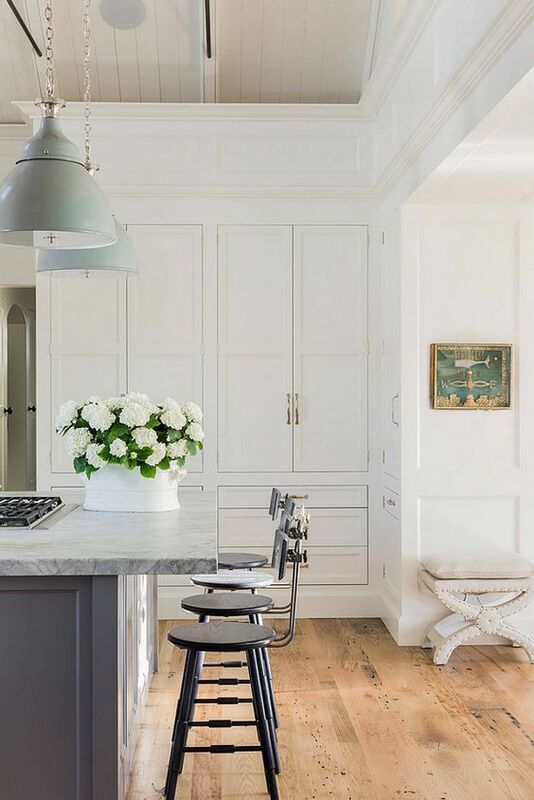 No more reaching over a counter to those upper cabinets and if you are truly daring, place limited items on a shelf that’s at an easy to reach height (think the breakfast bowls, dinner plates, a couple mugs and a few glasses). I know that a lot of people hate the idea of shelves because, well dusting, but I think it works as long as you limit the items to things you will use and wash daily. If you are not complete sold on my love for this design style, I’ll let the photos below speak for themselves. I’d also love to hear your thoughts in the comments below. 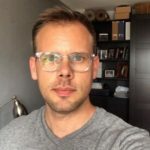 Is this style right for you? 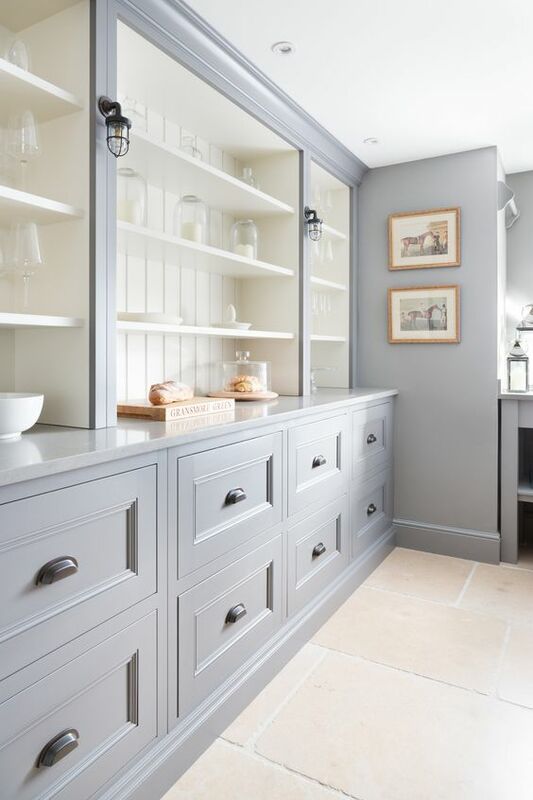 I love the openness of this pantry wall and that integrated counter for a work surface. The drawers off to the right side are simply a must. After all, you can’t ever have enough drawers in a kitchen. Wow, just wow. 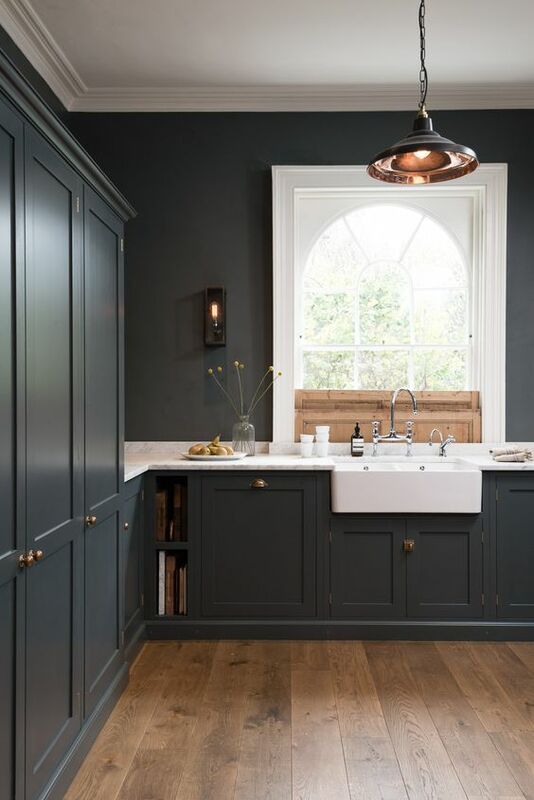 The bold color in this kitchen really works and it’s a good example of the end results (particularly around the sink) that you get when you free up the space normally occupied by upper cabinets. 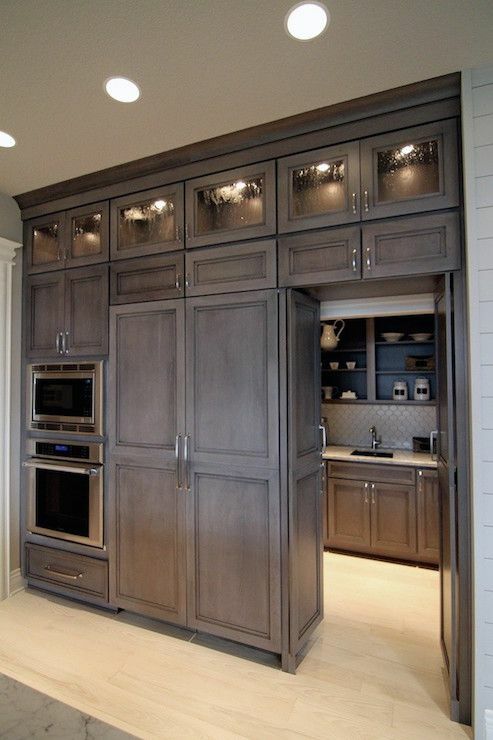 This kitchen gives you a good sense of the full execution of the pantry wall and in this case brings the concept onto a second wall in a smaller fashion for the oven and refrigerator. What you can see here is how open the rest of the kitchen feels when you get rid of the upper cabinets. What I love here are the oversized drawers. I get that the open shelves aren’t for everyone and limit the type of items you want to store here, but those drawers! Oversized drawers are great for mixing bowls, dishes, pots and pans and more. Why burden yourself with reaching to the back of a lower cabinet when you can have full extension drawers making everything easy to access. This pantry wall offers a couple nice touches that are worth noting. First, as I mentioned above, those drawers! 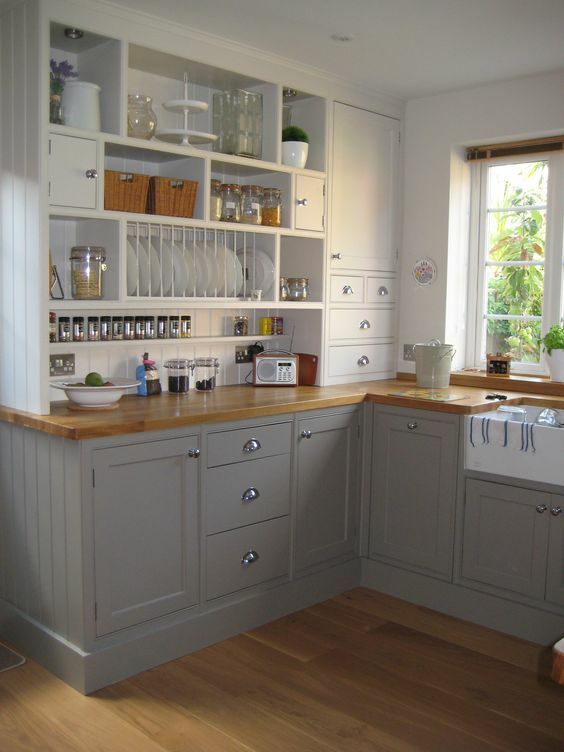 Lots of drawer storage which I feel is key in any modern kitchen. If you are concerned with boxing off a tight space, giving yourself glass doors may be a solution – although you’ll need to make sure these spaces are always kept neat and tidy. 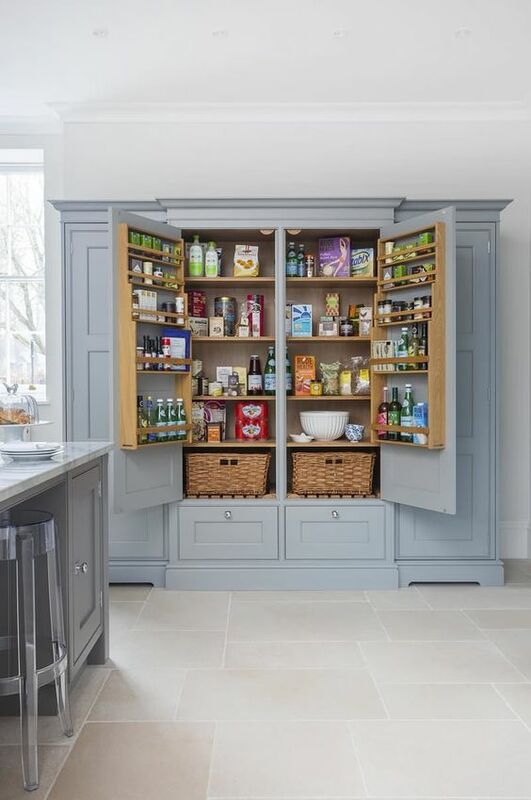 Now this pantry wall has an extra touch of luxury – and space – with the butler’s pantry tucked back and behind, masked with the secret cupboard panel doors. 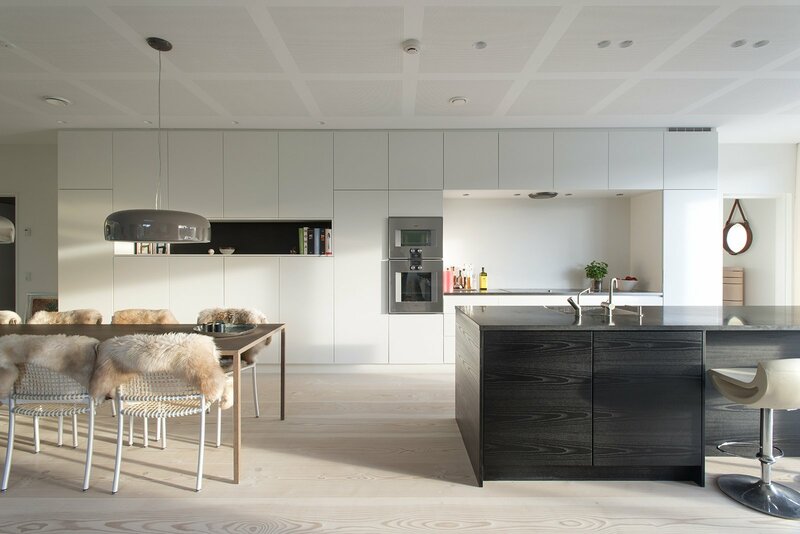 This kitchen is the height of good Scandinavian design with those flat panel cabinet doors and sleek hardware. What I love here is the area dedicated to a few open shelves. 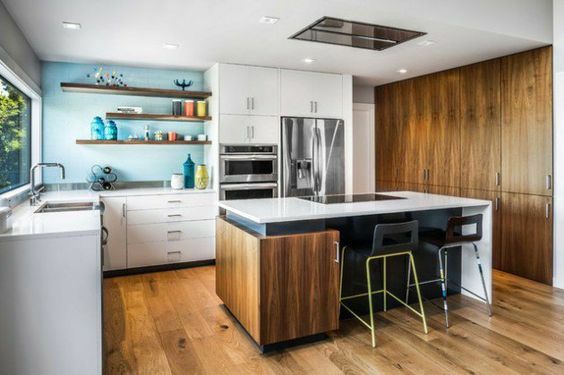 Not only does it provide sense of depth for this wall, but also a great place to store a couple cookbooks or cherished items you want on display. Aside from reaching down into base cabinets or reaching up into high cupboards, I deplore having to bend down to access the oven. Especially during a heavy holiday bake-a-thon. That’s why I love wall ovens and there is no better place for them than in your pantry wall. Easy to access, and seamlessly integrated. I’m just going to put this one here because it’s so pretty! 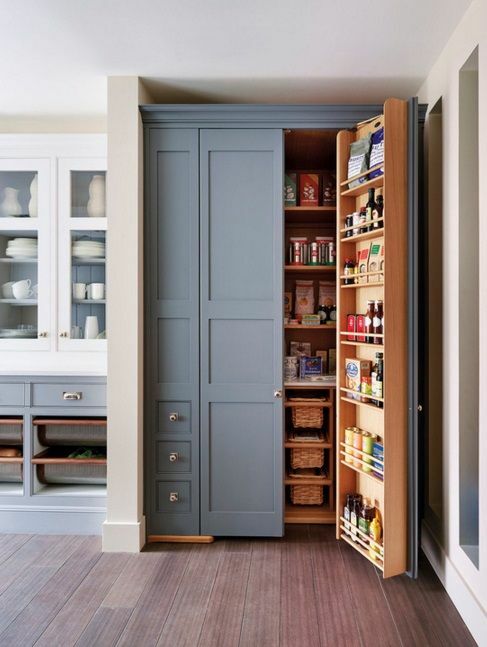 This is a great example of how you can leverage that built in counter space on your pantry wall. It makes a clever nook for appliances such as the toaster or your stand mixer. Use it in place, or easily take it out when needed. Ok, so I’ve tackled the design aspects of this wonder we know to be the pantry wall. But in diving into this trend I also stumbled across some great ways to integrate storage, maximizing every square inch. Here are some examples of our favorite storage solutions. This pantry wall literally has it all! 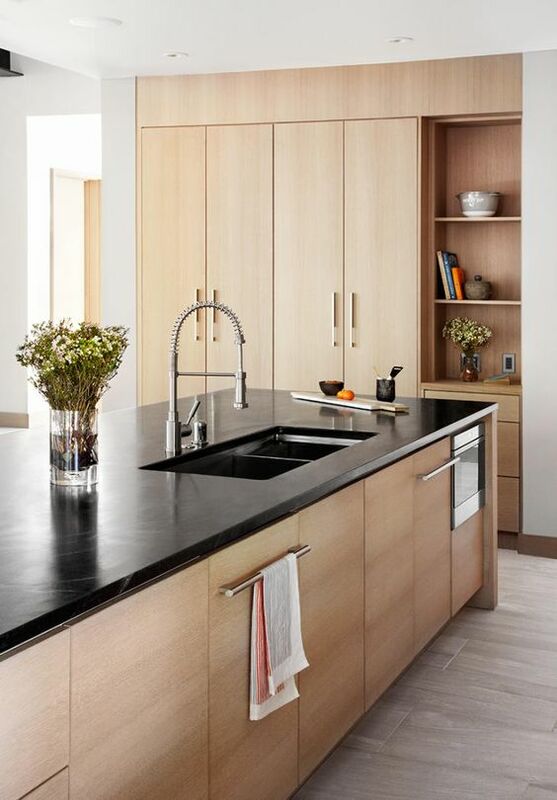 Full extension drawers hidden behind a standard cabinet door helps keep a sleek minimal look to the kitchen. 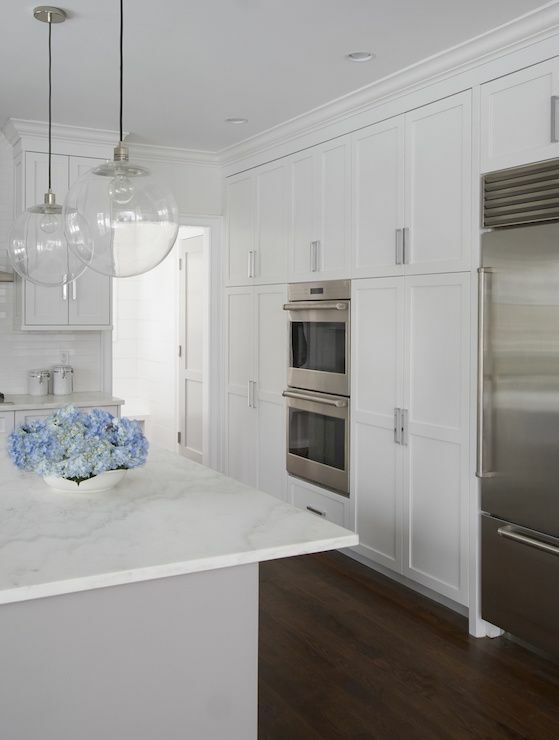 By integrating the microwave, oven, and refrigerator you can really round out the utility of this space. 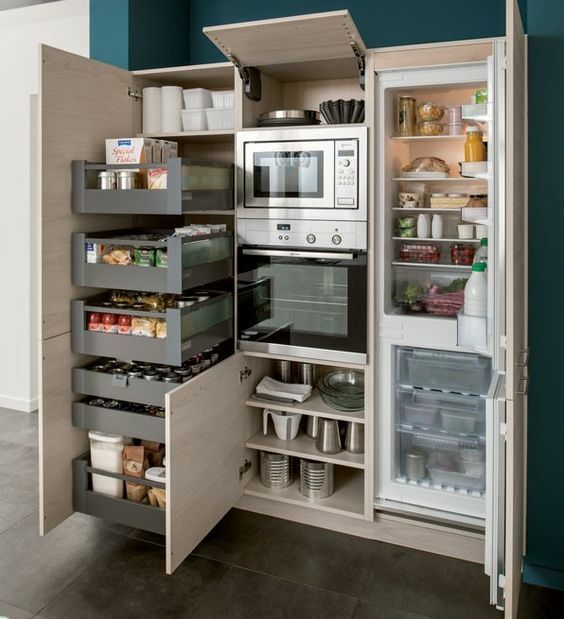 Definitely consider storage solutions for behind your cabinet doors. It’s a great place for smaller items like condiments, spices, etc. Here you get the full feel with pull out baskets, shelves, and behind the cupboard door storage. 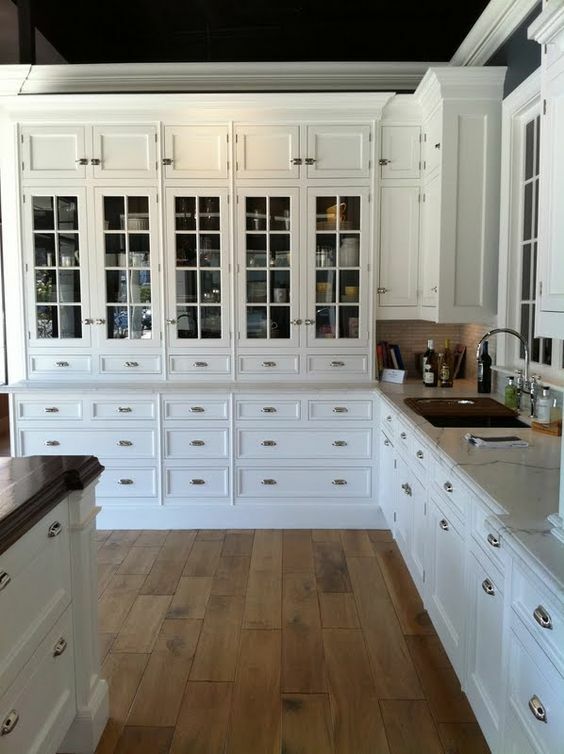 Don’t under estimate the end cabinets, especially if the space is narrower than is optimal. 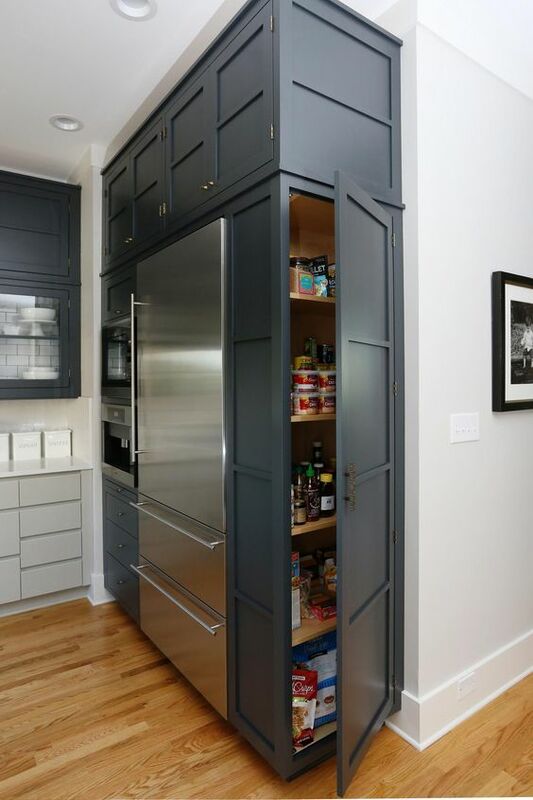 By placing the door on the end of the cabinet you make the space easier to access and more useful. 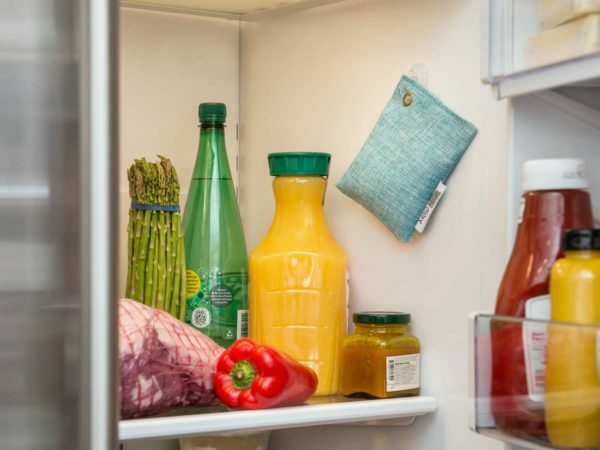 Odor in the fridge? We have charcoal for that!